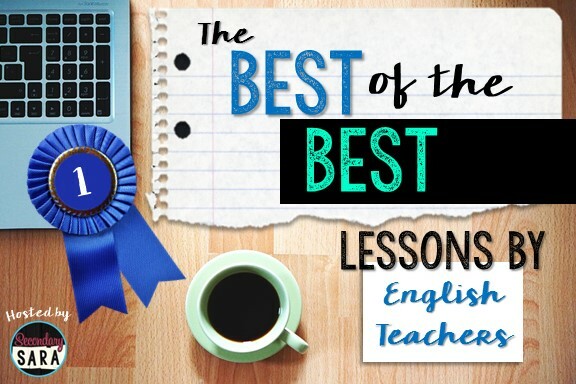 I’m excited to join up with host Secondary Sara and a bunch of outstanding ELA teachers to bring you The Best of The Best of our teaching ideas and ELA resources. Thanks for stopping by! Bell ringers are a terrific way to start a class successfully, focusing your students on the day’s class content, giving you a few minutes to do some clerical work, or providing your students a quick and engaging opportunity to practice their writing skills. One of the best selling resources in my TpT store is one that I break out on a regular basis: Bell Ringers for Any High School Classroom. I designed these PowerPoint bell ringers with stunning images to attract teens’ attention and paired them with intriguing prompts on a variety of teen-friendly topics that encourage them to write with reckless abandon! Well, they are effective, but maybe not reckless abandon effective. I love using them because there are no complaints from my major complainers and the pencils start flying immediately; judging from the feedback that the resource has received, many other teachers love them as well. So now that you’ve got the first 10 minutes of class covered, did you ever think of bell ringers pulling their weight at other points during your class period? Bell ringers, as it turns out, are heavyweight, versatile multitaskers that can be used at various points during your class period and in some not-so-typical ways. Here are five different uses for bellringers that will help you fill gaps between teaching activities and encourage your students to write more frequently. And here’s more good news – prep for these activities is minimal. For the most part, all you need to do is have the Bell Ringers downloaded and ready to show and have notebook paper or index cards for students to write on. Nothing fancy is required! 1. TURN ‘N TALK: No paper needed, and it’s quick! Students share their responses verbally without writing a word. When you have 5 minutes to fill or when you need as a brain break, Turn ‘N Talk is the way to go. What to Do: Show any one of the bell ringer slides that does not require a detailed answer. 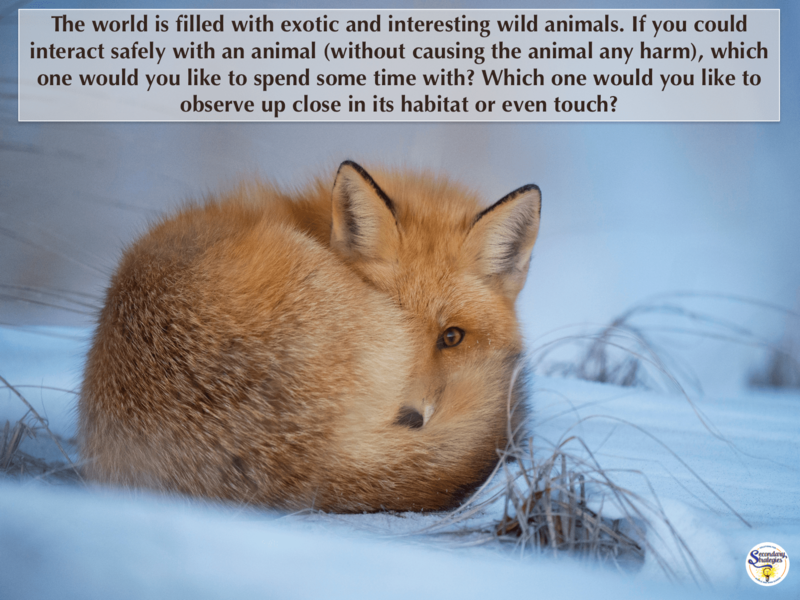 , asking students to read the prompt and to formulate a response in their heads that they will share with one or two other students. What to Say: “Take one minute to read the prompt, analyze the photo, and think about a response that you will share with one or two other students verbally.” After one minute has elapsed, say “You will share your response with your partners with each of you taking turns to talk without being interrupted. When it is your turn, avoid saying “I was thinking what he or she said, but, instead, share your own thoughts aloud. Be sure to share thoroughly, but don’t monopolize your group’s time. 30 seconds to one minute each should be enough time for each person. Once each of you has shared, then you may discuss your responses as a group. 2. SWITCHEROO: Students write knowing that others will read and reply to their responses. What to Do: Ask students to write their response on individual sheets of notebook paper or on a Google doc that can be shared with other students. What to Say: ”We are going to close class today with writing. I will show you the prompt and set the timer for five minutes so that you don’t have to worry about going overtime. Please write for the entire five minutes if possible.” When the timer rings, ask students to fold their papers in half and hand them in as an exit ticket. You can begin class the next day with a recap of the prompt responses or with students reading or sharing their responses. What to Do: Encourage students to stretch their creative muscles with this prompt response by writing a vignette – a tiny story or part of a narrative. Stella awakened when she felt the jolt – or at least that’s what she thought she felt. It was probably nothing, she muttered to herself as she swung her legs out of bed. Bad dream or that fat cat of hers jumping off the bathroom counter – again. It was only when Stella, in her sock-covered feet, slid downhill toward the bedroom door that she realized that something was very wrong. 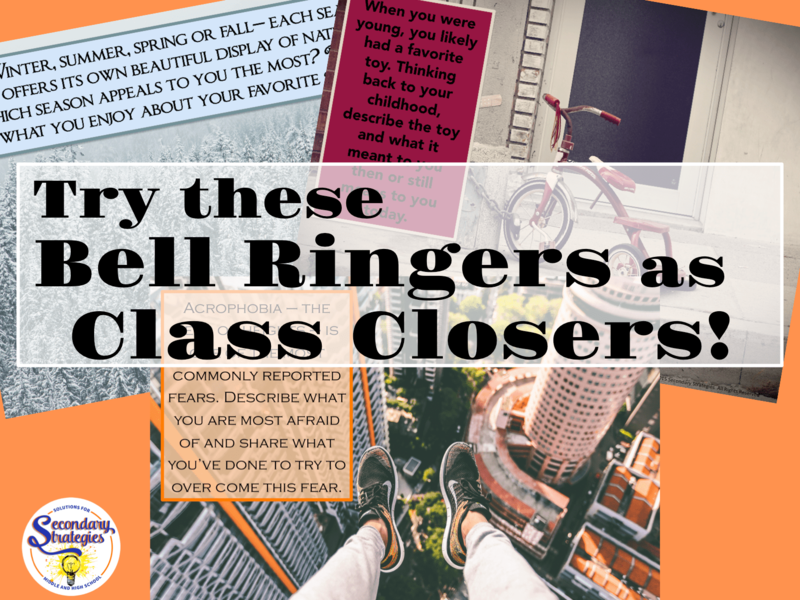 I hope that you’ll find success using these bell ringers with your students. Their unique uses is limited only by your imagination! When you’ve used the bell ringers in this first set, you may want to give Bell Ringers for Any High School Classroom – Set 2 a whirl! Stop by my TpT store for these bell ringers and more creative, innovative resources to help you find solutions to your most pressing teaching needs! ON SALE! Both of these Bell Ringer sets, my Poetry Bell Ringers, and my entire Tpt store are on sale November 1st and 2nd. Save 20% today! FREEBIE! Here’s a bell ringer to use TODAY! Just click on the image to display and GO! Log into the Rafflecopter giveaway below for up to 17 chances to win one of three $25 Teachers Pay Teachers gift cards! How to Bring Act II of The Crucible to Life! I love the turn and talk! We use it almost every day so every student needs to think and talk. 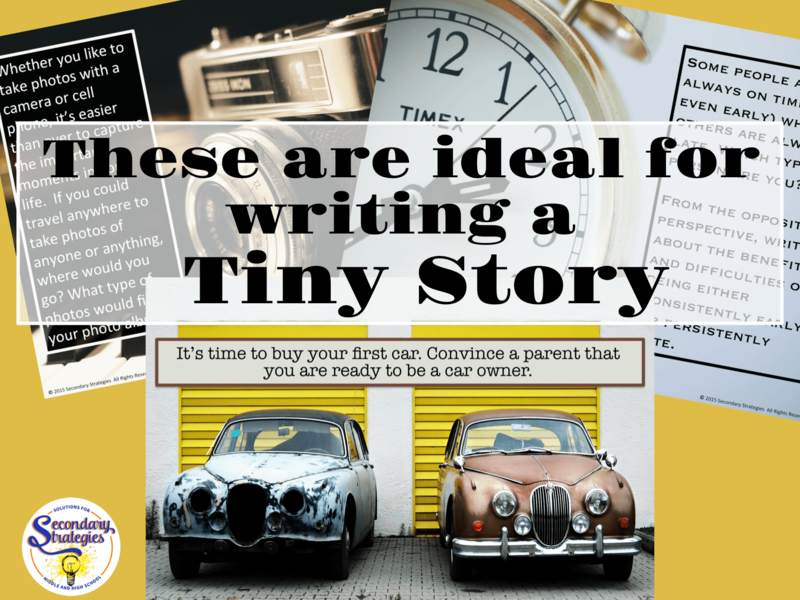 I like the tiny story idea – I’m going to use that soon. Thanks for sharing! I love these ideas! How awesome and original. Thanks so much for sharing. What a wonderful way to turn something boring and required like bell ringers into a refreshing activity students enjoy. I love the idea of a “goofy-footed” response. This seems like a fantastic way for students to let loose in their writing. Thanks for sharing! Thanks for the fabulous post with so many ideas and strategies! I, too, LOVE bell-ringers. They’re so versatile! And I definitely won’t complain about the few minutes of sanity they give me at the start of each class period. 🙂 Thanks for the extra tips on how to incorporate them! Good ideas. I really like the “Goofy foot” one. I would think that would really encourage students to think about their support, having to address both sides. Thanks for sharing! Goofy foot is a GREAT idea. thanks for sharing, love your blog. Thank you for sharing your fantastic ideas! I like how you are able to use these bell ringers at any time throughout class for meaningful writing and discussion. I especially like the goofy foot idea, and I think it would work so well in an argument unit. 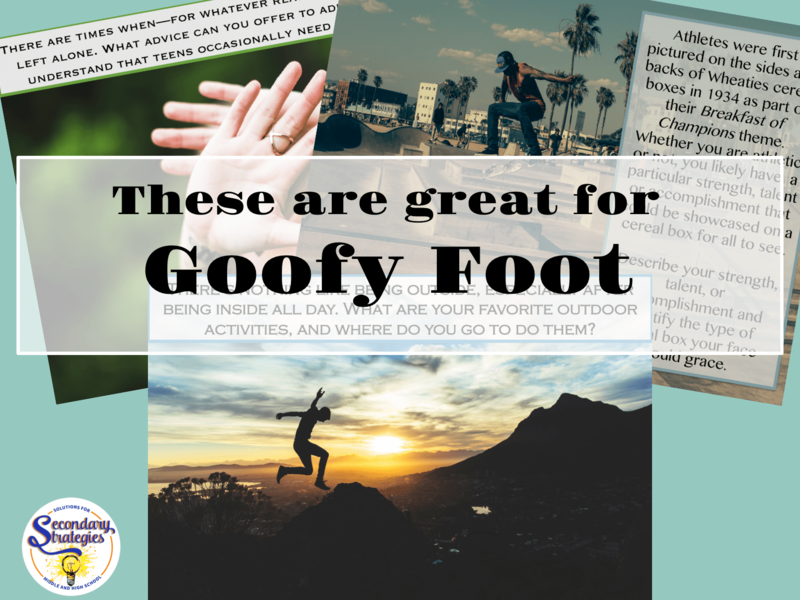 Love the Goofy Foot idea – my students would have so much fun with that! They’re all snowboarders and skateboarders and will love the reference! Thanks! Love, love, love these ideas to incorporate quick writing into class! I agree that engaging pictures make great prompts and also help with reading non-print text. 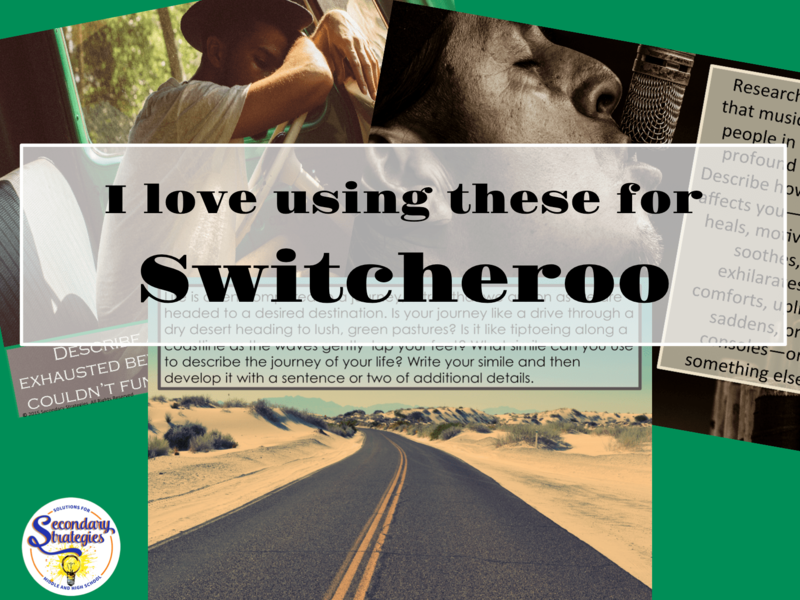 I use “turn and talk” frequently and will need to try “goofy foot.” The “switcheroo” sounds like my written conversation organizer, which is basically a silent conversation. Thanks for sharing! There are so many great ideas for bell-ringers here! I want to try them all! Pinterest here I come! I am not a high school teacher, my husband is. I have one child also in high school. So when I found your blog through the TPT raffle, I wasn’t sure what I would find…however, I was so excited to see that some of your ideas can actually transfer to both daughter and husband. For community service projects your post truly has great ideas to help build community and help those in need. I will be passing this blog along to my husband! Great ideas!